It’s that time of year again! 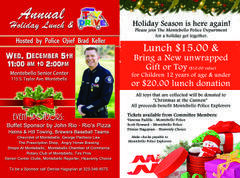 The Montebello Police Department is hosting its Annual Holiday Lunch and Toy Drive on Wednesday, December 5th from 11:00 am to 2:00 pm. The event is hosted by Chief Brad Keller and will take place at the Montebello Senior Center located at 115 S. Taylor Ave in Montebello. The donated toys will be given out to families at the annual Christmas at the Cannon event on December 24th. All other money raised will go to the Montebello Police Athletics and Activities League (PAAL) and the Montebello Explorer Post 1034. We are still looking for event sponsors and raffle prize donations. Some raffle prize ideas are gift cards, gift baskets, small electronics, and items to help advertise your business or anything else you would like to win at a raffle. If you have anything you are willing to donate please contact Denise Hagopian at (323) 346-8575. Tickets can be purchased at the door. Tickets are $15.00 with a toy donation ($10.00 toy value) or $20.00 for lunch without a toy donation. If you can't make it to the event we are accepting donations of gifts ($10.00 value) for children at the police department. If you have any questions please call Denise Hagopian at (323) 346-8575 Cpl. Scott Howard at (323) 887-1324.